Forest and crabapples with Ivy. At the lower elevations, the northern California forest in September is a dry and dusty place, but it still holds many sights to see and ponder over, if you are lucky enough to be with my daughter Pippin, as I was last week. I had long hoped to travel the several hours to celebrate little Ivy’s birthday with the family, but business here at home kept me up in the air about my plans until the last minute, when I realized that it would be possible for me to make a quick trip up and back. On my one layover day we three “girls” walked in the woods. We chose to drive to a little park not far away this time, instead of making our outing to the woods right behind their house. I’ve written before about how Pippin has always had her senses keenly tuned to the natural world; when I am outdoors with her she stops to notice many details of flora and fauna that I am blindly passing by. I doubt I would have seen these slugs descending from a tree on their slimy rope, but once I saw them I had to record them with my camera. Pippin told me that this plant is called Pinedrops, and is similar to Snow Plant in that it lives symbiotically on the fungi that in turn live on tree roots; for most of its life you don’t see it above ground. While my eyes were probably on my boot tops, Pippin noticed a large wasps’ nest in what she took to be a dogwood in the stage of bearing fruit. I wondered how many wasps might live in that large house. We also stopped by a fish hatchery where Ivy fed the various species of trout, and I spied a commonplace wild sweet pea that I thought uncommonly healthy and pretty. Back at the house, I took up the challenge I never can resist: trying to photograph the crabapples. They make me wish I were a real photographer, so I could capture how gorgeous they are. At Pippin’s they have two or three varieties, and the Professor shakes the trees from time to time in the fall and winter so the fruit will fall on the lawn and feed the deer. Pippin is a gardener as well as a naturalist and her dahlias are worth the drive north just to visit them. This trio she had just brought in for the birthday party table. I didn’t entirely ignore the grandboys, but because it was Ivy’s birthday I didn’t feel bad focusing on her this time. Given that I have eleven grandsons and “only” three granddaughters, you might understand my feelings for the girls. This year it was a Dragon Cake she wished for, and her parents were obliging. They added a castle for context. Happy Birthday, Ivy! Between tonight and tomorrow this subject must become theoretical, as Monday my church begins fasting in preparation for the Feast of Saints Peter and Paul. 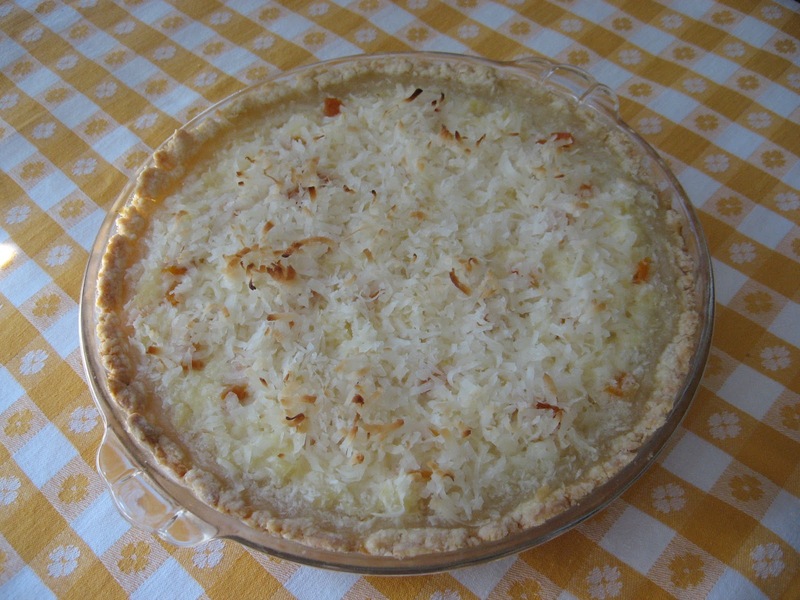 Though I admit to making vegan desserts, like this coconut pie for Father L.’s birthday, usually I’d rather just wait until a fast-free day to enjoy the butter and cream. Hey, by then I’m happy to pour cream in my coffee and call it dessert. But that’s not festive enough for a picnic, or for a tea party. I think both of those events demand some cake, if they are going to be traditional (in addition to the scones, if you want those). Sadly, our family is generally lacking in cakes, with the major exception of Pearl, who learned on her own and makes lovely ones. I don’t think her household lacks cake; I don’t know anything about their picnics. I can’t grant that much myself, because my very few attempts at cake decorating beyond the sprinkling of some coarse sugar did not draw any comments about prettiness. My favorite topping for children’s birthday cakes of long ago was an array of gumdrops — but with that we start slipping into the candy category. It may have been Big Sister Pearl who baked this birthday cake for Soldier, using plenty of that ingredient that is so important. 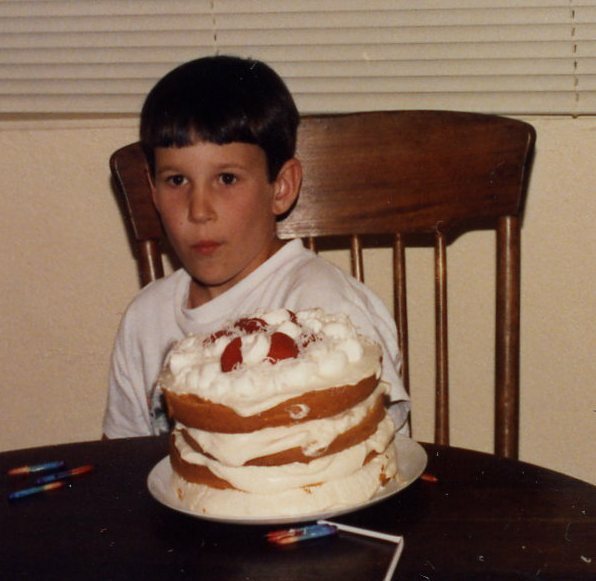 I can see something in his expression that hints at what he would do 20 years down the road: leave cake out of his wedding altogether, in preference for pie. I blame bloggers for giving me the feeling that something is missing. 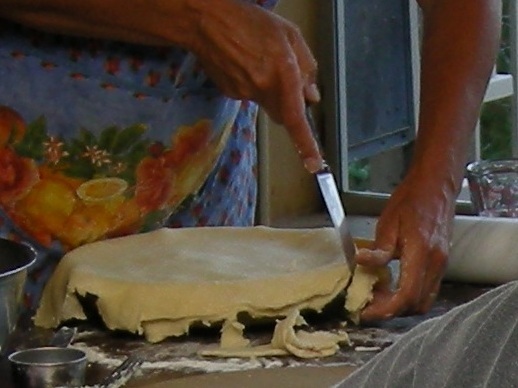 Have you noticed how many blog posts have been written about this or that recipe for cake, which comes out of the oven in the late morning or afternoon just in time to have a slice with some tea, at the kitchen table with the children just home from school, or just taking a break from homeschool? It’s not clear how I would work that tradition into my lifestyle at this point. My husband would be alarmed and reluctant, to put a good spin on it, and might not eat any cake. 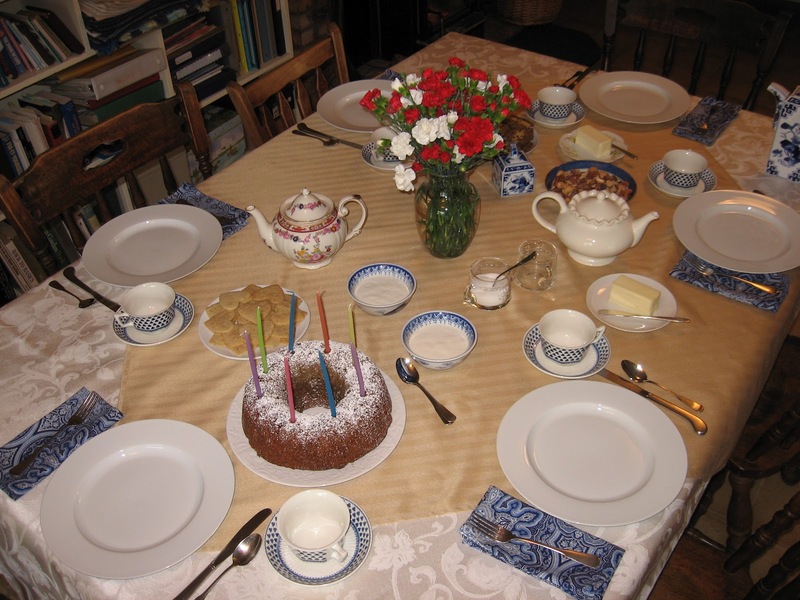 I’m considering reviving my Girlfriends Tea Parties just so I can make a cake or two. When I did this before it was a great way to try out a few of the hundreds of dessert recipes I have in my collection. After we sampled them together, all the ladies took home most of the leftovers to share with their sweeter-toothed husbands. One huge advantage to packing the cake into a basket instead, to be eaten on a blanket spread under a tree, is that I wouldn’t have to clean the house beforehand. But the Old English style of picnicking has also not caught on in the Glad Tribe. Our group has favored throwing handfuls of trail mix into their mouths so that they can get to the mountain peak and back before dark. None of this leisurely sitting around eating and fattening up. But I have a new desire to broaden our style in that regard, too, probably from reading too many blog posts about Wind in the Willows and grown-up girls taking their Toad and Mole dolls on outings with yummy noshables. It’s good that I will have a few weeks to think about these important questions — or rather, not to think about them. And by then I’ll be too busy getting ready for a new grandchild, and getting ready for a trip…Then there will be another fast, and then another new grandchild. All these ideas for events that require a Lot of Planning really don’t fit in this summer. But it won’t take long to throw together a pie to set before my dear husband, a blackberry or cherry would suit just fine, and leftovers won’t be a problem.